At least in the stock 1.13 maps, sectors are very empty and devoid of civilians. They also don't have to say that much. This is rather sad. Unfortunately, adding civilians to maps requires the use of the map editor. For someone not used to the editor, this is not a simple task. For this reason, I've decided to add a new functionality that allows us to create civilians on any map we want much more easily. And while I am known to rant against the usage of LUA more than often (jsut ask the guy's in IRC ;) ), in this case, LUA scripts are the best place to do this (xml being to inflexible in this case). secretaries to places that seem like they'd have some. This also includes dialogue. These new civilian groups so far don't do anything unusual (I nevertheless list them in the code, in case we later want special code for them). 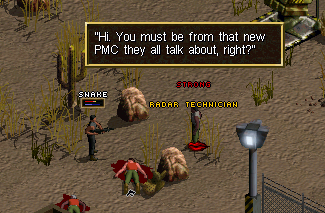 In the above example, the civilians are only created when the player has never liberated this sector before - whether you use that is up to you. This feature can be turned on and off via ALLOW_EXTRA_CIVILIANS in Ja2_Options.ini and is set to be off by default. This has been added to the trunk in r8132 & GameDir r2311. Using the new exe without the new GameDir does not cause anything dangerous, for once. It just makes me sad. One question: when you write "won't stay around once you take the sector", that means that the civilians will disappear once the current sector is unloaded? which is a new variable I added to the script. For these civilian types I added here, it seemed reasonable to only have them spawn if the player has never taken this sector. It would make no sense if prison wardens would still appear in the prison if the player has long taken it, no? In the above case, they will not spawn again if we take the sector. You can, of course, use the functions without that particular check (or add any lua checks you like). HandleSectorTacticalEntry is called every time we enter a sector. It's futile to try and keep a mod at the newest feature release because of this. Stable releases may be a pain to get together, but modders need a stable platform to build on or they will be forever changing and re-changing their modifications to incorporate new features. Every time I figure it's safe to bring AV up to the newest release . . . a new, untested feature comes along that makes a major change. you dont HAVE to jump on the newest features once they're released..
Just pick a version that you want the mod to work on and continue from there, all that could happen in newer versions is some red lines during startup. 1) a unique occurrence per sector, happening exactly once when we first enter it. From then on, numbers, appearance, equipment etc. are stored, and when we reenter the sector, the same civs as before are there. 2) occurring whenever we enter a sector (subject to any hard-coded/scripted limits like ), and once we leave the sector, all civilians are forgotten, to be created anew from scratch when we reenter the sector? So in the example above, when I reenter the sector, there a 20 goons again. After some thinking about the new possibilities this feature opens up, a couple of additional questions popped up in my head. When setting civilians with the map editor, we can either select relative attribute levels (bad/poor/average/good/great) or - with detailed placement - select exact attributes. Would it be possible to add something like that to your feature? Would it be possible to set a civgroup to hostile via script (something analogous to KingPin alarm, but without needing a trigger)? Is it possible to query the game facts listed in quests.h via LUA? It's behaviour 2, actually. If you don't want these guys to respawn, you have to decide that by altering the lua script (like checking for a face etc.). -- Add the pilot at a random location! In this case, it is used to set up (possibly) hostile bounty hunters I added for a new quest where I tried to externalize as much of that quest as possible. As for making a group hostile, that might already be in lua, not sure. Yes, I realize I don't have to jump to the newest features . . . unfortunately, not all that can happen is inconsequential error messages on startup -- though that is highly amateurish to have happen. There have been new executables since AV has started, and many XML tags have been moved about. While AV works on the early 2015 versions of 1.13, it doesn't work on newer versions. I'm not going to spend my time every other month re-working and playing catch-up. Just sayin'. I love what Flugente is doing, but I am very grateful to Sevenfm for bringing a lot of the fixes to 7609, and for improving the AI tremendously in 7609. Extremely useful information re: spawning behaviour, random locations, attributes, creating armed civilians and and checking game facts. Thanks a lot! After thinking about it a bit more, in my opinion it could be useful to combine elements of CreateArmedCivilain(..) and CreateCivilian(..). The one gives us control over equipment and attribute levels and hostility, but the other gives us much finer control over appearance and specific items. I would love to be able to create a hostile armed civilian with red hair, pink skin, wearing blue pants and a red shirt that definitely carries an NVG and a sniper rifle, for example. Hmm. I guess I could expand both functions. Items are somewhat of a problem though - I currently create armed civilian as soldiers, which takes care of their equipment. Having custom items override that requires a lot of additional stuff (deleting preset items depending on what custom items are set,taking care of ammo, attachments, all this with regard to the progress values...). Additionally, it seems to me that huge problem any modder would have with lua is that they cannot store any state variables. There are the games facts, which we access with CheckFact() and SetFact(), but these are hardcoded, and modders only know those that coders deemed intersting enough to put them into the script. Theoretically, a modder can store things (like whether they spawned someone somewhere) in there, but as you don't know without code knowledge wwhich facts exist and what they are used for, that's a recipe for disaster. ...though the drawback is that currently, you have no way in lua to know whether a specific enemy dies (you also have no way to get the specific ID of someone). All requires additional code interfaces. I guess what I try to say is: I am aware that modders would like to be able to have better interaction with lua, but this requires a lot more work on the coding site of things, as you have to create interfaces for every function. Additionally, as we cannot debug lua, any stuff a modder does in there becomes so much harder to test and check for errors. - Items: I'm not sure how intelligent the AI actually is. When we just add an item w/o deleting preset stuff, would the AI make use of it? E.g., when an ArmedCivilain is equipped with an MP5 (from being created as a type of soldier) , and gets an additional G3 allocated via the same process as in CreateCivilian(), would the AI use the G3 if a target is outside MP5 range? Then we could just stuff up to 4 additional items into the civilians inventory. Of course the modder will have to take care of any needed ammo etc. - state variables: all very true, and such an array as you mentioned would indeed be a valuable addition for a couple of mini-quests. I would flat-out refuse to store my own custom facts somewhere in "game-owned" variables, way to many ways to screw up the game... Though I could also write some state info to a text file via LUA, IIRC. Not knowing if a certain civilian is dead/was already encountered/etc or not might indeed make some quest ideas impossible, but I still have a couple in mind I think I could do without. For example, accept that certain civilians spawn only once (controlled via your array idea), and the player gets just this one chance to kill^h^h^h^h interact with them. Or have one "trigger" named NPC, and as long as he lives, his henchmen re-spawn. The AI would sometimes use it. It does check whether it has several guns which one to use (afaik), but this would not work on armour. Additionally, a modder might want to explicitly have an enemy use a specific item (like, say, the leader of a criminal gang using a custom-set golden desert eagle). Without controlling the entire inventory, this might not happen (so on, say, higher progress values, the enemy might get spawned with a MG3 and use that, which is reasonable gamewise but not what the modder intended). Well, controlling the entire inventory would be the luxury version, but also slight overkill, IMHO. I would be more than satisfied by CreateArmedCivilain(..) extended by appearance (hair, skin, dress) and possibility to add some items without replacing auto-generated ones, and on the other hand, CreateCivilian(..) extended by the hostility setting and maybe a relative skill level. A modder-administered array of integers would be icing on the cake. My original idea of writing to/reading from an external text file via LUA creates a nightmare of synchronization if save/reload is taken into account. So cows are responsible for holding back the zombie apocalypse? Yep, the cows are holding back the undead. Any civilian would do, but apparently, cows worked best. I assume this is because the average gamer is less likely to shoot a cow than kids/cripples in wheelchairs/women in miniskirts. Aren't we a happy, mentally healthy bunch of people? Actually, I've found that placing a civilian inside a cliff -where available- works best. Even the worst serial killer type of gamer simply can't kill him. Mortars. Lots of mortars. On-map mortar teams. Off-map mortar teams. No civy is safe. We're going to do the village, the whole freakin' village. @Flugente: is it correct that the new groups (Secretaries, Radar technicians etc.) are not listed in CivGroupNames.xml? Eh? No, they have their own entries, just like all other groups. Edit: Or should have, if I had committed them. And hadn't overwritten the changes later on in my xml-editor adventures. Hmpf. There are a few holes in there (like UNNAMED_CIV_GROUP_22) which are mostly for civ groups in important mods. I think at some point I asked a few modders whether I should leave some open, which I did there, so they didn't have to reorder all civvies. EDIT: This was supposed to be for the new merchants (Marvelous!) . . . but somehow the forum put it here . . . Wonderful indeed! Less need to wait for Mr. snack vendor to replenish his supplies. Now I'm wondering if town influence/morale is going to come into play. Town's okay with you = Plain ol' inventory. Town loves you = You get the good stuff.